Itadakimasu! The phrase every proper Japanese and Japan enthusiast worth their salt will probably know and utter before every meal. “We give thanks and appreciate this meal that we are about to partake”, all summarised in one simple phrase. Food brings people together. Whether we are cooking together, bringing food to eat together, or just going out for a meal, good food is often the catalyst of good conversation, and good conversations make are the perfect seasoning for any meal. One of the topics that came up during a recent meal was that “for any imaginable topic, there will be an anime or manga written about it”. A few Google searches confirmed that as a fact. Anime about video games? Log Horizon and Sword Art Online are just some recent ones. Pirates? One Piece. Ninjas? Naruto. One of my personal favourites “Hozuki no Reitetsu” which discusses office politics in Hell. Anyone who has worked in a corporate environment at some point will find this anime is highly relatable. 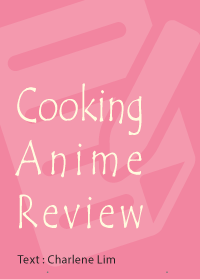 But since this topic came up over a meal, I wanted to explore and review anime and manga relating to food and cooking. To do your own (rather enjoyable) research on these titles, you can stream anime legally off sites like Crunchyroll or Animelab. As for manga, the Amazon Kindle store, or tabletcompatible Manga reading apps are a good way to buy, read and organise them. For each title in this review, I gave it a Realism Rating, which indicates how much a given anime or manga reflects reality. A Realism Rating of 1 indicates incredibly unrealistic themes and scenarios, while a 10 is the realistic end of the spectrum. Besides the four mentioned here, there are many more cooking-related anime and manga out there — more than I have time to watch and read! Most of them deal with realistic aspects of cooking and food, but wrap them in an entertaining plot or setting, while likeable characters and comedy serve to drive the plot forward, even while educating the reader. As with any other genre of anime, there is a huge variety of choice out there, whatever your tastes! Gochisousama! Japanese Cuisine, Sake, Ramen & Gyoza, Fish – Sushi & Sashimi, Vegetables, The Joy of Rice, and Izakaya – Pub Food. The characters in the manga introduce actual recipes that readers can use to make the food that features in the plot. This manga lacks a storyline, since it is mostly a compilation of selected extracts from the original anime series. However, it appeals to me as it showcases the type of food and effort a good restaurant takes to prepare a dish according to the season and what the customer requires. It also teaches some good food etiquette when eating Japanese cuisine. These are highly useful skills if you are planning to head over the Japan at some stage. Sticks closely to real life situations. Covers a lot of different types of food. The only unrealistic plot point is the frequency with which the protagonist finds himself bumping into his father, and being caught in situations where he has to cook for a restaurant to prove himself. 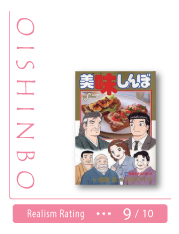 A manga about bread making by Takashi Hashiguchi, with the English language version published by Viz Media. Azuma Kazuma is a novice baker who is seeking the type of bread that would best represent Ja”pan” (a play on the word Japanese word for bread, pan). A distinctive feature of this title is the exaggerated reaction that the various characters have upon eating delicious bread. In extreme cases, the person consuming the bread ends up visiting heaven. Most reactions involve a variety of puns related to the type of bread created. Most of the breads created are real and can be replicated. A famous example is the rice cooker bread, which the manga provides a recipe for. Of course, the Realism Rating is impacted by the over-the-top reactions, as well as plot points like abnormally warm hands or highly flexible fingers that give certain characters the edge in making bread. By Natsumi Matsumoto. A “talentless” girl was spotted by a chef of a famous patisserie school in Japan, who recommended her for enrolment to the St Marie Academy. With the help of the top 3 students in her year, she discovers her talent for creating spectacular art pieces with pastries, and works very hard to achieve her dream of becoming a pastry chef. 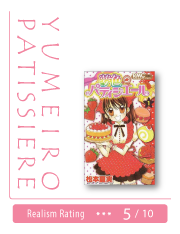 To help move the plot along, Yumeiro Patissiere introduces a parallel world, where Sweets Spirits training to be pastry chefs and are sent to the human world to help and assist people who have potential to be great chefs. Pastry-making fairies obviously bring down the realism of this manga. 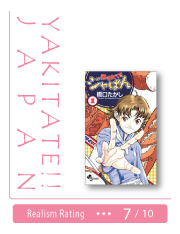 However, this title involves cooking real food, and the manga contains recipes that readers can follow and use. Additionally, a lot of the pastry creations in this series reflect the increasingly fantastical work of pastry chefs around the world and even in Australia, who have created amazing pieces of art from cakes and pastry. of ingredients for his “Full Course Menu”. This Full Course Menu resembles a degustation at a restaurant, and consists of 8 components: Hors d’Oeuvre, Soup, Fish Dish, Meat Dish, Main Course, Salad, Dessert and Drink. Each individual’s Full Course Menu reflects their own character and their goals in life. 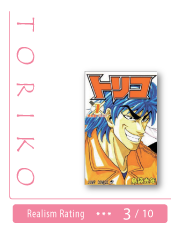 Toriko’s world features fantastical (but delicious-sounding) ingredients like marsharock (marshmallow rock), pudding camels, bubbly tuna and BB corn. However, the characters are shown to be very serious about food, with a lot of care taken in sourcing ingredients and preparing food.